Grow your own food anywhere with this weather-resistant, cedar Raised Bed Garden Kit! The simple tongue and notch design assembles easily without tools and can be customized into various shapes and structures. Want to grow your own food but don’t have much space? Our 32” Raised Garden Bed Kit is perfect for you! You can grow a great amount of food in just a small area with a raised bed garden. These kits work great for growing an herb garden with herbs such as rosemary, thyme, basil, sage, and cilantro. They also provide wonderful garden containers for winter crops such as broccoli, cauliflower, kale, swiss chard, romaine and specialty lettuce varieties. The cedar planks are naturally weather, rot and insect resistant, which means it’s going to perform well and last in any climate. Each raised garden bed kit includes eight 4” x 32” wooden sections and eight 12” galvanized ground stakes. The simple tongue-and-notch design of this raised bed garden kit assembles easily by inserting the galvanized ground stakes through each piece. Stakes are long enough to anchor each corner of the raised garden bed kit into the ground. 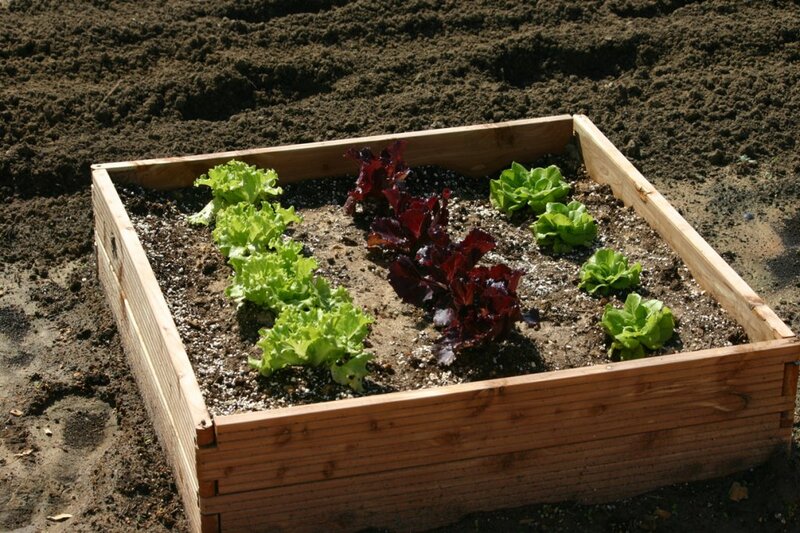 Raised bed kits may be arranged into a variety of designs. One kit will assemble into a basic 32” long x 32” wide x 8” tall structure. Purchase more than one raised garden bed kit to configure multiple shapes and patterns such as an octagon, an L-shaped bed, or beautifully staggered raised garden bed structures.